We must follow the state rules at the District level to be eligible for one-acts to proceed to the State level. OCPS teachers it is your responsibility to be in compliance. There will be boxes located stage left and stage right. Load in door has a maximum height of 7’ 10”. Plan accordingly. Only basic reassembly of set pieces will be permitted during load in time. Walkthroughs can happen during previous block’s load out. For a detailed look at the decisions made at the September meeting, please see the minutes. District V will follow the State rule regarding students NOT being allowed to establish character during the slate. Sound Design and Makeup Design will continue to be Extraneous Events at the District V festival. They will also be extraneous at State, which means that a limited number may proceed to State to represent District V.
Registration. The registration fee has changed from $20 to $30 to account for rising expenses in the recent years. Please remember that most troupes add fees for transportation and other expenses. One Acts. Judges will assign Best of Show One Acts to performance spaces at State, eliminating a need for 1st, 2nd, 3rd, etc. Best of Show One Acts and one alternate will be announced at Closing Ceremonies. All Best of Show One Acts will receive a Best of Show trophy. IEs. The new tech events, Makeup Design and Sound Design, were adopted as EXTRANEOUS EVENTS for the 2013 District V Festival. Playwriting. All submissions will be entirely digital, and the use of script formatting software is encouraged. Scholarships. The district has added 2 new scholarships. Each school can now bring 3 scholarship applicants. The State Board has brought the rules and formatting for Playwriting into the 21st century! Students are now encouraged to use formatting software (such as Final Draft, Script it, Scrivener, Slugline, Trelby, Storyist, or StoryO; all cost under $100). If you are unable to obtain these programs, you may of course use whatever word processor you have, following the new standards outlined by the board. The most notable change is that students will NO LONGER SUBMIT HARD COPIES of their plays at District or State. 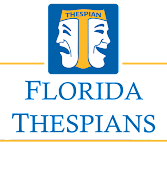 Rather, they must e-mail a PDF to District V (or Florida Thespians at the State level). The District V One Act Event follows the State One Act Rules, in conjunction with the District 5 By-laws, Section C.
At the January 2013 meeting, the sponsors voted to clarify the State rule by adding the verbiage shown in bold. State Rule #1.6 — For a One Act play to be considered for State and perform at State, it must receive at least two Superior ratings in Performance. DQs are not eligible for State consideration. In the past, District V used the asterisk system alone to communicate the presence of offensive material. Beginning in the 2013-2014 year, sponsors must include the brief description mandated in the state rule in addition to the asterisks. The relevant rule is shown below. State Guidelines & Considerations #2 — Sponsors must notify the District Chairperson at the district level and the State Director at the state level if the play contains language and/or stage business that members of the audience may find offensive. A brief description of the nature of the offensive material should also be included. An alert to possibly offensive material will be noted in the program. At the January 2013 meeting, the sponsors discussed changing the asterisk system to be more descriptive since there is a broad spectrum of material that might receive the same asterisks. The sponsors voted not to amend the rule, but agreed that performers should not be penalized should they choose to clarify the asterisk during their slate. The relevant rules are shown below. State General IE Rules #1 — An introduction MUST include ONLY the entrant’s name(s), title of selection, troupe number and notice of asterisk material. Do not give name of school or other information. The time begins after the troupe number is said. State General IE Rules #3 — If your piece contains material that MAY offend members of your audience, you are REQUIRED to asterisk the piece on the Individual Event Registration Form and you are REQUIRED to include in your introduction that your piece contains “material that may possibly offend” and you are REQUIRED to allow a few, brief moments for audience members, should they choose, to leave. The State updated several rules at the State Board Meeting last August. Details can be found here.